Using Amateur Radio in an Emergency. Why Training & Certification ? Public Service has and will continue to be a very important part of the Amateur Radio Service. Our continued existence as a hobby may be dependent on our ability to demonstrate a continued need of our very valuable part of the radio spectrum. We continually demonstrate this need by participation in numerous training exercises such as Field Day, SET etc., and by providing communications during public service events - parades, bike-a-thons, races to name but a few. Over the last several years mainly due to reduced licensing requirements we have added many new amateurs to our hobby. While there is strength in numbers, ours is still a technical hobby and we depend on this level of expertise when participating in public service events. As amateur radio emergency communications has continued to evolve, it became apparent that some form of formal certification would soon be necessary in order to assure that we continue to provide trained and professional communicators for public service events. What Training Is Currently Available ? Amateur Radio Operators can currently take advantage of three main sources of Emergency Service training, The ARRL EmComm Program, The American Red Cross and The Federal Emergency Management Agency (FEMA). All are excellent ways to increase your knowledge and skill level and we encourage your participation in any or all of these resources. Many are even available at little if any cost. President George Bush has already stated that the amateur radio service may prove to be a vital part of Homeland Security in the future and we must be ready to provide skilled professional communication services for our community and our country. A short introduction of source of training is presented below. (Nov 27, 2009) -- The content of the new emergency communications course is undergoing final review and the decisions about what shape this new course will take have been made. I’d like to update you on our progress, what changes are being made and what may be expected of you. As we have said previously, the former Level 2 and Level 3 Emergency Communications courses are being updated and combined into one new course. The new course will focus on emergency communications training for leaders and managers. The title of the new course is Public Service and Emergency Communications Management for Radio Amateurs. We anticipate launching this new course in January 2010. It has been developed in a lesson format and will be posted on our website and, as such, it will be viewable by any ARRL member. Members will need only log in to the ARRL website to see the course material. It will not be a mentored course. Later on, we may provide a mentored online forum on our website where students can post questions about course topics and receive answers from a mentor. The new course requires that the student has previously completed the Level 1/Basic course, certain FEMA courses and has some experience with Amateur Radio and emergency communications. Those who desire to receive a course completion certificate for this new course (which we refer to in shorthand as “Advanced EmComm”) will first need to document that they have satisfied a list of prerequisites. After providing the necessary documentation, applicants will be required to pay an enrollment fee of $35 to gain access to the course’s final exam. This fee will help to offset the cost of developing the course and for the online testing service as well as costs for administrative support. Completion of FEMA courses that are background for this course. Please note: the list of FEMA course as prerequisites, as well as those referenced internally within the course, may change as FEMA makes changes to its course offerings or the course is modified to introduce new content. Applicants will also need to supply a reference from their Section Manager, or his or her designee, stating the reason for the applicant’s participation. Section Managers will take into account the applicant’s relevant experience or role within emergency communications and whether they are in good standing within the amateur radio community. Once applicants have documented that these requirements have been met and they have paid the course evaluation fee, they will receive access to complete the online exam. We are also making provision for unlicensed individuals who perform an official role as an emergency responder to earn the course completion certificate if they desire. To apply to take the final exam and earn the course completion certificate, these individuals will need to obtain a “waiver” recommendation from the local ARRL Section Manager. This waiver request should include a description of the position of responsibility the applicant holds in an emergency response organization. Note that these individuals will need to be an ARRL member to obtain access to the course on the ARRL website. Later on, when other media formats are available there may be additional ways to access the course materials. grant-funded classes stands at 1277. "We're pleased with the success of the program to date and with how far we've come," Miller said. "We're right where we should be under the federal grant guidelines." The nearly $182,000 federal grant, announced last July, will subsidize online training for up to 1700 amateur licensees during its first year. The CNCS grant permits students successfully completing the Level I program to be reimbursed for the cost of tuition. Miller says another 200 students registered this month and will begin classes January 21. "Interest in the on-line classes remains high," Miller said. "Registration for this month's classes filled within the first few hours, leaving many potential students frustrated." The good news, Miller says, is that there's still plenty of room in future classes to allow interested amateurs to take advantage of the program. Senior hams are encouraged to enroll in these classes. One of the three main goals of the Red Cross is Awareness and Education. Our goals are: 1) to raise the public's awareness of the natural and human-caused hazards that threaten them; 2) to educate people on what they can and should do to better protect themselves and their property; and 3) to motivate them to take those steps. We develop and distribute a variety of materials designed to educate the public through our highly acclaimed Community Disaster Education (CDE) program. Our volunteers and employees, working through over 1,000 chapters, provide far-reaching electronic, printed and video materials as well as Public Service Announcements (PSAs) and community presentations that inform the public about how to stay safe and protect their home. Click below for a list of items available from the American Red Cross to use to educate the community before and after a disaster strikes. These materials often share the logos of other national organizations who share common goals with the Red Cross to help people prepare for, respond to, and cope with emergencies. Materials are available for order through your local American Red Cross chapter. If you are unsure where to find your local Red Cross chapter, look under "A" in the telephone directory for "American Red Cross." Through the Emergency Management Institute (EMI), FEMA's Independent Study Program (ISP) consists of self-paced courses designed for both the general public and people who have emergency management responsibilities. They are offered free-of-charge to all who qualify for enrollment, and college credit can be obtained through a for-fee service after successful completion of a course. Each Independent Study Course includes lessons with practice exercises and a final examination. Those who score 75 percent or better are issued a certificate of achievement from EMI. Course completion times vary from two to fourteen hours, depending on the course and the student’s background. Click Here to go directly to their site. 17 Members of the MARC under the direction of club Training Coordinator Charlie Scherger - KB8STV completed the first of what we hope will be a semi-annual club training program series. Our first attempt at this type of "no charge" training was FEMA's sponsored "Emergency Response to Terrorism", presented by the National Fire Academy. This course, part of FEMA's Independent Study Program, consists of self-paced courses designed for both the general public and people who may have emergency responsibilities, a perfect starter for amateur radio operators involved in the Amateur Radio Emergency Service. Their website, Click Here, gives a brief introduction to the program with links to their many available home study courses. With Charlie as course instructor and assisted by Don Finley - W8DEF, the basic outline of the course was presented through slides which defined what terrorism is, types of terrorism incidents, appropriate responses and basic HAZMAT fundamentals. Participants were then required to complete a twenty question open book test at the conclusion of the class. Once submitted, recipients will receive a nice certificate of completion from FEMA. A special thanks goes out to Charlie, MARC's Public Service Award recipient for 2001, for spearheading an effort to provide additional training to the amateur operators of Stark County. This is one of the major goals of the Stark County ARES and Charlie is helping us to achieve this important goal. Congratulations to the following MARC members for successfully completing this initial FEMA class. They are Gary Kline - WC8W, Randy Phelps - KD8JN, Don Wade - W8DEA, Anne Ballinger - N8GAF, Linda Finley - K8MOO, Perry Ballinger - W8AU, Bruce Putnam - AB8FB, Russ McMahen - N8PII, Gene Beckwith - W8KXR, Jules Laborcane - KA8MMN, Byron Berger - KF8UN, Jack Wade - N8LCS, Rick Garner - KC8LYG, and Terry Russ - N8ATZ. Our instructor Charlie Scherger - KB8STV, assistants Don Finley - W8DEF and Jason Stroll - KC8LIN have previously taken and completed this course. On Tuesday, March 19th, members of the MARC participated in a Red Cross class held at the Western Stark County Chapter in Massillon. The class "Introduction To Disaster Services" was conducted by Bruce Robinson, Director of Emergency Services. The video based course introduced participants to disasters, the community response, and the role of Red Cross Disaster Services. The class covered the seven major areas of disaster services and is a required course for those who wish to join the Red Cross as a volunteer. Club participation was exceptional with 18 members taking part in the introductory course organized by club Training Coordinator Charlie Scherger - KB8STV. Congratulations to the following for taking part in this Red Cross course. They were, Don Finley-W8DEF, Jason Stroll-KC8LIN, Bryon-KF8UN, Gary Lewis-W8SSB, Don Guisinger-KC8RPE, Don Wade-W8DEA, Linda Finley-K8MOO, Jim Farriss-WA8GXM, Terry Russ-N8ATZ, Ann Ballinger-N8GAF, Rich Ross-KA8ZQH, Randy Phelps-KD8JN, Charlie Scherger-KB8STV, Jules Labourcane-KA8MMN, Sam Marang-WA8YGR, Bruce Putnam-AB8FB, Gene Beckwith-W8KXR, and Gary Blagg-KC8IHR. Members Don and Linda Finley, Jim Farriss and Sandra Becker-N8TZB have been involved in the Red Cross for many years and Bruce Robinson hopes the introductory class will inspire a few new volunteers ! Why Is This So Important ? 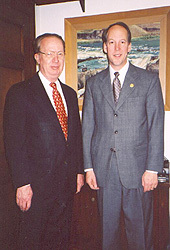 NEWINGTON, CT, Mar 12, 2002 -- ARRL President Jim Haynie, W5JBP, says Amateur Radio got a positive reception during his fourth visit to Washington, DC, to visit with regulators and lawmakers. Haynie headed a contingent of ARRL officials and staff members February 26 to March 1 on visits to the FCC and Capitol Hill among other stops. The centerpiece of the series of Washington visits was ARRL's participation in a National Public Safety Telecommunications Council (NPSTC) brainstorming session, chaired informally by Gene McGahey, AL7GQ, of the National Law Enforcement and Corrections Technology Center. The February 27 session considered improved means to incorporate Amateur Radio into public safety and homeland security planning. Participants also looked at the possibilities of increasing the role of ham volunteers in public safety and emergency communication. Among other topics, discussion focused on improving recognition by public safety agencies of Amateur Radio as a resource and further upgrading the level of professionalism among Amateur Radio Emergency Service (ARES) and Radio Amateur Civil Emergency Service (RACES) volunteers through enhanced accreditation and training. The session also touched on the need for a universally recognized identification card or credentials for amateur volunteers. Representatives of the Federal Emergency Management Agency (FEMA), the American Red Cross, The Salvation Army, the FCC and the Association of Public-Safety Communications Officials (APCO) were among those on hand for the session. Haynie told the gathering that amateurs are looking for opportunities to participate in disaster relief, that they are typically resourceful and that they have an innate curiosity about solving technical issues. Ham volunteers not only can bridge a communication gap when conventional means fail, Haynie suggested, but could be recruited to help restore service or offer on-site guidance to resolving technical and communications problems. 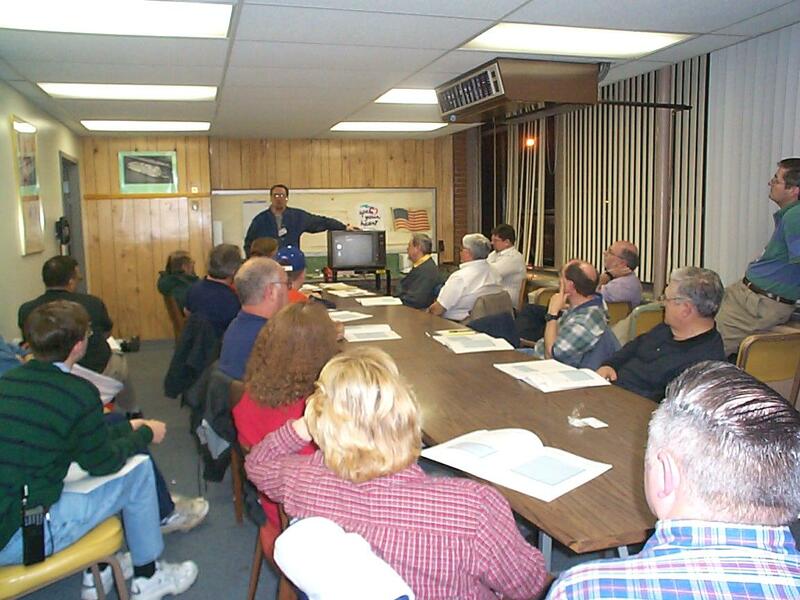 Other discussion centered on the possibility of forming a highly trained first-response cadre of Amateur Radio volunteers who would undergo ongoing training and accreditation plus periodic credentialing. "We will be going to ARES and RACES to recruit the best and the brightest," Haynie said. While in Washington, Haynie also met with a representative of the US Department of Transportation concerning ham radio's potential role in homeland security. A meeting will be set to discuss ideas in greater depth, he said. Your local Stark County ARES coordinators encourage your participation in the many training exercises and education opportunities described above. We maintain ongoing records of the training received by area amateurs throughout Stark County as well as active ARES Registration. This information is shared with both area public safety officials as well as the Stark County Emergency Operations Center. We are committed to providing a source of professionally trained and disciplined core of Amateur Radio ARES volunteers prepared to assist our community where ever and when ever needed. Take advantage of the opportunities available to you as well as the VEC Testing sessions that now include the ARRL Emergency Communications Certifications. It's a great way to enjoy your hobby and serve your community !